Jim Haley, Chairman of Miller & Martin, thanks the panelist for their presentation. 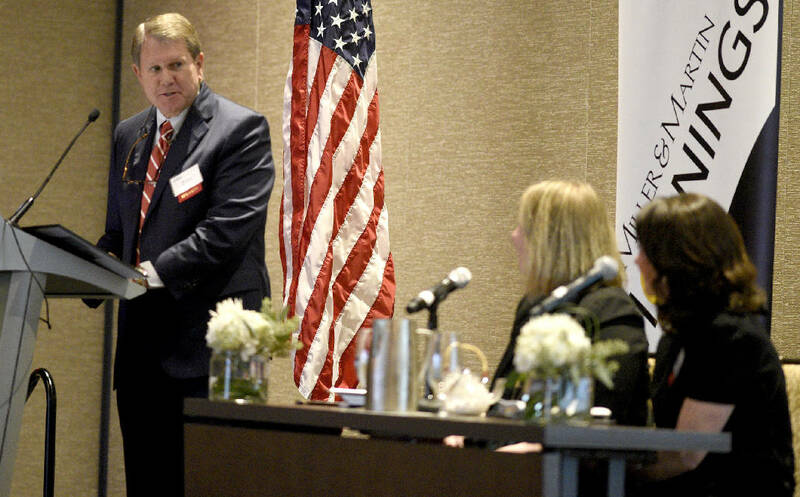 Miller & Martin hosted a post-election panel discussion featuring University of Virginia's Miller Center panelists a the Westin Hotel on November 9, 2018. President Donald Trump's highly scrutinized Twitter use is innovative and will alter the way future leaders communicate with the electorate, two political experts told a crowd at a post-election panel Friday. While the panelists, hosted by the Miller and Martin law firm, didn't support the president's divisive rhetoric and tone, its members compared the president's direct communication with the way previous presidents used radio and television in earlier decades shortly after their inception. "The next president is going to have to be on Twitter, is going to have to be on social media," panelist Mary Kate Cary said. "I don't see how you put that genie back in the bottle." Cary was a White House speechwriter for George H.W. Bush. She is now a senior fellow at the Miller Center of Public Affairs at the University of Virginia, which was named for Miller and Martin co-founder Burkett Miller. The nonpartisan group focuses on presidential history and policy. Cary was joined by Miller Center Assistant Professor Nicole Hemmer for a political discussion hosted at the Westin Chattanooga by the local law firm. Trump isn't the first president to use the social media platform, but he uses it most effectively, the two panelists agreed. Former President Barack Obama also used Twitter but usually had others posting messages for him and didn't change public conversation based on his tweets of the day. "The important thing about how [Trump] uses Twitter is not just that he uses it, but that he is authentic and innovative," Hemmer said after the event. "He uses it in a way that drives news coverage and shapes conversation." Trump gets his message directly to the public without it being shaped by speechwriters or going through traditional media outlets, she said, and for the most part, the two seem to believe the strategy is working. Republican senators who had been critical of Trump — and whom the president has criticized on Twitter — are being replaced. Former Chattanooga mayor Sen. Bob Corker, R-Tenn., has engaged in several highly publicized spats on Twitter with the president, who has posted the senator is "incompetent" and has set the U.S. "way back." The senator previously tweeted "the White House has become an adult day care center. Someone obviously missed their shift this morning." Corker announced he was not running for re-election and will be succeeded by staunch Trump supporter Marsha Blackburn, who defeated Democrat and former Gov. Phil Bredesen on Tuesday. And Republican John Kyl will replace one of Trump's biggest adversaries, Arizona Sen. John McCain. The midterm after the election of a new president usually sees gains for the opposing party. There was a lot of interest in whether a Democratic "blue wave" would sweep through Tuesday's election after the polarization of the 2016 election, Hemmer said. "In a way, there really was a blue wave," she said. "The Democrats will maybe pick up up to 35 or 36 seats in the House, but they lost seats in the Senate. That was expected, and yet, at the same time, for Democrats who were looking for a crushing denunciation of Donald Trump's administration in the midterm election, they didn't get that." Corker opened the morning discussion with a closed-door, off-the-record speech to the crowd. The ensuing panel discussion addressed polarization, the shift within both major political parties, the 2020 election, the role of the Supreme Court and other political topics. Attendees were encouraged to interact and ask questions. "These ladies that presented today are obviously students of the presidency, students of the political environment," Dixie Group Inc. Chairman Dan Frierson said. "They gave a very good picture from very different perspectives of what happened in the election and the probable outcomes in the future." For Miller & Martin leaders, that's precisely what they were hoping to provide post-election. "We've been fascinated by the work the Miller Center does studying the presidency and other national, international issues," Miller & Martin Chairman Jim Haley said. "We think by bringing representatives of the Miller Center to Chattanooga, we can give them a flavor of some things they might otherwise not have available to them."